Our Jatbula ‘Plus’ itinerary affords you the time to discover the Jatbula Trail and the wonder of the Nitmiluk Gorge as well as enjoy a fantastic aboriginal cultural experience. Or you can just meet us in Katherine for only the walking segment, a 5 Day Walking Itinerary. Fully Guided, All Inclusive of Cultural Tour and Gorge Cruise. Provided: Guide, Ex Katherine Transfers, River Ferry and Trail Fees. The Katherine Region has many attributes not the least of which is the famous Nitmiluk Gorge and a strong Indigenous Culture, both of which you can experience on this great trip. You will hike between 10 and 17 kilometres per day, completely dependant of your campsite destinations, which can be reached between 12pm and 2pm each day. On arriving at camp you are free to relax, swim, read and enjoy the beauty of your surrounds. Each campsite has its own water source, from a small babbling spring fed creek to a 30 metre high waterfall. Each afternoon brings about a different pool or spa to sit back and relax in. Each day will also present to you a new set of challenges, from river crossings to hill climbs (nothing too big mind), there will be flat open country on the top of the escarpment and boggy wet country along the creeks that we follow. Something new around every corner, whether you are an experienced hiker or just someone who is willing to try something new and exciting. Using qualified, accredited guides, this trip covers approximately 63 kilometres of stunning walking trail. Wildlife encounters, self sufficient ‘backpack’ camping, fantastic service, – it all adds up to being a unique experience. A trip you may never forget.The Jatbula Trail is an ancient ‘Song Line’ used by the Traditional Aboriginal people of the area. It covers lowland river and creek country, hillsides dotted with dry land eucalypts, higher escarpment country overlooking the Seventeen Mile Valley and beyond and pockets of moist paperbark forests where the temperature drops and you find yourself sitting in a cool comfortable environment. 6:30AM-7:00AM pick-up from Darwin. We stop for a leg stretch at Pine Creek, an historical mining town. Mayses Cafe is famous for a great Mango Smoothie. You will arrive in Katherine in time to take an optional boat cruise in the magnificent Nitmiluk Gorge and participate in one of the regions best traditional cultural activities, spending time with local artists and trying some of the age old traditional practices of firelighting, spear-throwing and painting. Tonight we camp at Nitmiluk National Park. Day 2 – L, D, Camping – Hiking approx 10kms. Your friendly guide will pick-up you up at 7 am approximately from your Katherine accommodation, where you will be transferred to Nitmiluk National Park and the 5 day walking trail, here you will catch a boat across to the mouth of the Seventeen Mile Creek where your trail begins. Hiking into Northern Rock hole for Morning Tea allows time to adjust backpacks and hiking boots before they get too uncomfortable. Take a rest in the shade, drink some cool water and then continue onto camp at Biddlecombe Cascades where there will be time for a relaxing soak in some of the scenic and shaded rock pools. Day 3 – B, L, D, Camping – Hiking approx 12kms. After starting early – always good to get going on sunup – we continue on our way to Edith Falls. Today we will see the first of our Rock Art paintings, sheltered by an amazing rock formation; we will spend Morning Tea, again resting our backs and feet before moving onto camp at Crystal Falls. Crystal Creek is a great place to get out and stretch the body in the huge waterhole right beside the camp. Day 4 – B, L, D, Camping – Hiking approx 10kms. Another early start gets us to the Crystal Falls Lookout first thing for a sunrise, then we move onto the Amphitheatre for Morning Tea where we can leave our packs behind for 40 mins and descend into the cool monsoon forest to explore for more Rock Art, or maybe just sit in the shade and enjoy the serenity. Camp tonight is at the top of 17 Mile Falls, a walk to the bottom can be arranged, or you can just relax at the top of the falls in one of the cool and scenic pools. Day 5 – B, L, D, Camping – Hiking approx 16kms. Setting off at sunrise will give us time to get to the Edith River Crossing for a late Morning Tea/Early Lunch. Again a great place to take off the backpack and let the feet relax for a while. After our break we arrive at camp for the evening, a place called Sandy Billabong. Here you can swim or spa, a great place for bird watching in the afternoon, and the pool provides amazing reflection shots as the afternoon sky changes colour. Day 6 – B, L, Camping – Hiking approx 15kms. One more early start will get us through some long grass, across a couple of creeks and through a bog all in time to have lunch at Sweetwater Pool. This is another amazing place to have a rest and contemplate why we do what we do! After leaving here it is but a mere 5kms more to Edith Falls where we can take the scenic lookout walk back to the kiosk where a cold drink and an ice cream will be waiting for us. We will be picked up at 3:00PM and head back to Darwin, arriving at around 7:30PM, or for those returning to Katherine, you will be back in time to unpack and repack then return to your overnight accommodation where a warm shower and soft bed will be calling your name. 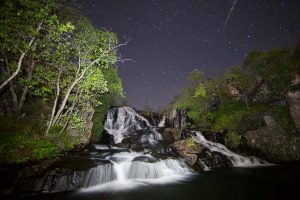 The Jatbula Trail is located within the boundaries of Nitmiluk National Park, following the Seventeen Mile Valley from Nitmiluk Gorge to Edith Falls. The local Flora and Fauna is prolific and the scenery is varied and beautiful. The Katherine River, Seventeen Mile Creek and the Edith River flow all year round and during the long drty-season, become the only water sources for all manner of wildlife. The Katherine Region is a terrific place to visit and base your Northern Territory experience from. We are close to The Kimberley, Gregory National Park, Elsey National Park, Manyallaluk, Kakadu Heritage Area and of course, right on our doorstep, is the magnificent Katherine/Flora/Daly River System. We are totally self sufficient giving us the luxury of being selective with our resting points, campsites however are designated due to the status of the National Park. There’s plenty of time to relax, swim, bird watch, encounter wildlife and appreciate the scenery. We regularly access these sites with group sizes of 2-8, ensuring that we have minimal impact on the environment. On the trail we are sharing sites with other hikers, numbers on the trail are generally small allowing groups to spread out and have their own area. How Far, How Long, When? The 5 day hike covers approx 63km between Nitmiluk Gorge and Edith Falls. The trail does not follow Nitmiluk Gorge, it actually tracks away from the gorge following 17 Mile Creek. Tours operate during the ‘TOP END’ dry-season, May to October. The temperature ranges from 24 C to 39 C, but the nights from June to August can be cool, dropping to 5 degrees Celsius. A liner (or sheet) and pillow, and a torch. A 75 litre backpack, (ruck sack), or you may wish to use your own. You will only need minimal clothing – you can rinse items out daily. Keep things as light and small as possible to compensate for food & water. We travel with no more than 12 people on tour including the Guide/s, (unless it is a specific group booking). Why not try this; An all inclusive 2 day adventure through the famous ‘Kakadu World Heritage Park’. Travel North will show you some of the top spots in the park whilst accommodating you comfortably in their semi permanent tented camp.